Trekking in Garhwal region in Uttarakhand Himalayas is extremely versatile,it has tougher treks for professionals in atheltic activity and easier for the novice in any age group. Family trekking is an different kind of experience, where fun and adventure are the main ingredients and with this sufficient amount of rest and stretch to keep moving until the destination comes. 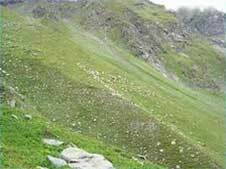 The trek to valley of flowers at an altitude of 3,300 metre to 3650 mtris such a trek which is easier and can be enjoyed with all age group of family. 'Paradise' will be the correct word which can be used for valley of flowers, where all fairies stay and an unending stories of this magnificent land can attract the nature lovers. The colourful and mesmerizing environment makes valley of flowers best experience of rejuvenation and energizing moments . The valley is full of flora and fauna. In leisure time the trekkers can spend their time in identifying herbs and shrubs used for ayurveda. Photography is the best activities which will leave an indelible mark on the visitors memory. There are huge mountain and large variety of birds to be clicked this valley you can find rich wildlife and veritable paradise birds which brings a perfect environment to enjoy this camping. Endangered animal species such as Asiatic black bear, Snow leopard , Brown bear and Blue sheep are found. UNESCO has recognised valley of flower as the world heritage site. No other valleys could match its beauty. Different colour of flowers such as purple, white and yellow look like a carpet to the valley. The route to valley of flowers can be started from Haridwar, Rishikesh and moving along Alaknanda river across the Bhadrinath highway to Govindghat from where the trek to valley of flowers starts. At valley we can discover mountain routes which are formed by cutting mountains. Moving forward at the distance of 12 kilometre the trek leads us to Hemkund Sahib, upto Gangaria, and from left to it 5 kilometres we can reach to valley of flowers. Family trekking in valley of flowers is so much fun for the degree of flexibility and relaxation included in it considering all the age groups. The memories of such a holiday trip continue to cherish because there is a motivation for fitness and inspiration to see the nature's bliss. Get to avail and unforgettable experience! Arrival at Joshimath by evening, check into the hotel. Dinner & overnight stay. Joshimath : The religious centre, established by Adi Shankaracharya, which he called Jyotirmath, later came to be known as Joshimath. Among the sites of interest are the temples of Nav Durga and Narsingh. Apart from its obvious religious importance, Joshimath is known for its scenic beauty. After an early breakfast drive to Govindghat. Which is the starting point of the trek? From Govindghat there is a gradual ascent along a well maintained pilgrim trail to Ghangaria. Upon arrival at Ghangria check into hotel. Dinner and overnight stay at the hotel. After breakfast trek to Valley Of Flowers (3858 m) from Ghangaria. The valley is an enchanting sight with an impressive array of rare wildflowers like Geranium, Marsh marigold, Prinula, Potentilla, Geum, Asters, Lilium, Ranunculus, Corydalis, Inula, Braham kamal, Campanula, Pedicularis, Arisaema, Morina, Impatiens, Bistorta, Ligularia, Anaphalis, Saxifrages, Sibbaldia, Thermo- psis, Trollius, Codonopsis, Dactylorhiza, Cypripedium, Strawberry, Epilobium, Rhododendrons and numerous others. Most of the flowers have medicinal values too. The valley is 10 kms long, 2 kms wide, and is divided by the Pushpawati stream, into which several tiny streams and waterfalls merge. After enjoying the beauty of valley trek back to Ghangaria. Dinner & overnight stay at the hotel. After an early breakfast trek down to Govind Ghat and from here Back to your Next Journey.